…is where we were trying to get to. With spring comes spring cleaning and organizing and for us that tends to mean more house projects. So get excited! There may actually be some home improvement posts in this little blog’s future! 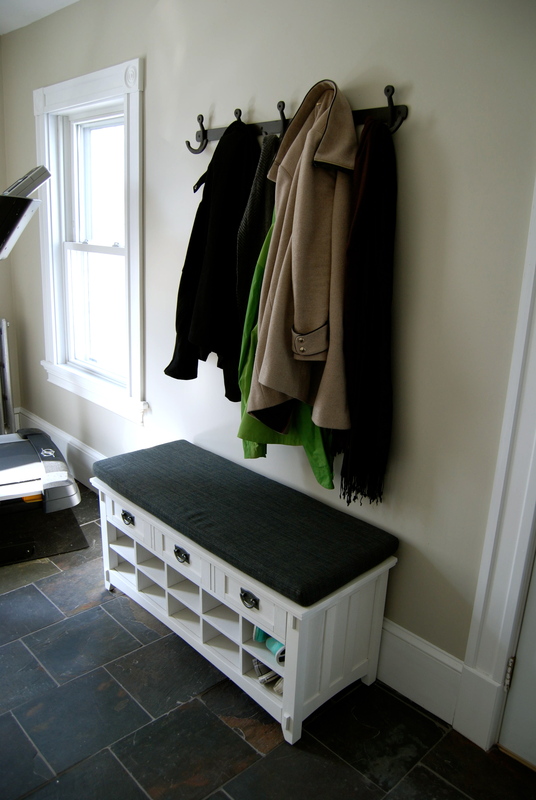 Today it’s a small one but a valuable one- the addition of a mudroom closet. We got this mammoth beast from- where else? Good ol’ IKEA. I knew we wanted to get one PAX System closet for quite some time now but with so many options for drawers, shelves, and hooks on the inside, I wasn’t positive of the combination I wanted. So with Eli with Grammy, Gramps, Jared, and I popped over to IKEA to make our selections. The woman in the closet section was super helpful. She hooked us up with a computer and I got to design away. With all the options on display, all I had to do was look around and see what kind of configuration we wanted. One shelf above the hanger bar (that you can’t even see in this photo) and another half shelf with four wire drawers. These are perfect for scarves, gloves, and hats. There’s a drawer for Papa Bear, Mama Bear, and Baby Bear. The hardware we chose was not IKEA. This is something we learned is key for not making your house seem like an IKEA showroom. We went with a really strong, heavy iron. It matches the anchor coat hangers we have. The cabinet really does look built in since it’s the same 8 foot height as the wall behind it and tucked into a corner. Our mudroom has really turned into a perfectly functional space for us. We even added this little message center that’s a chalkboard and a magnetic surface. It’s perfect for keeping info about Eli ready for Grammys or babysitters and walking in the door to those cute pics is almost as fun as seeing the little man himself! In honor of the first day of spring, we’re hanging our coats up. Well, not for good. It’s still quite chilly. 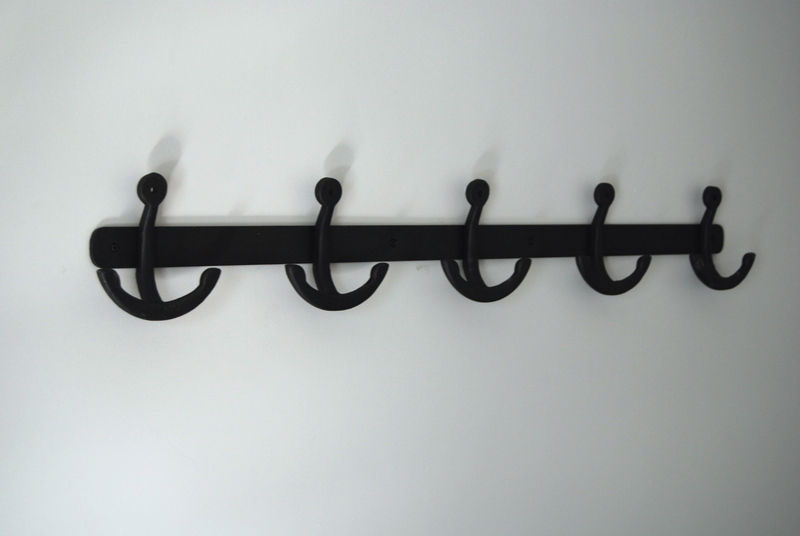 But we did get a brand new coat rack for our mudroom! 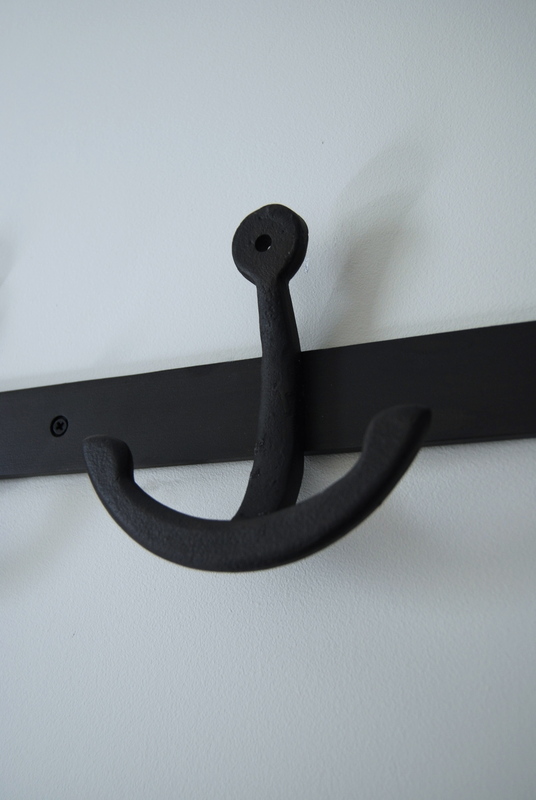 This row of anchor hooks from Pottery Barn is super sturdy and goes nicely with all the greys in our mudroom. We’re able to fit five coats comfortably, which in my opinion should be sufficient enough for everyday use. Our coats when guests come over along with off season coats will be kept in the closet we intend to install directly across from this rack in our mudroom. 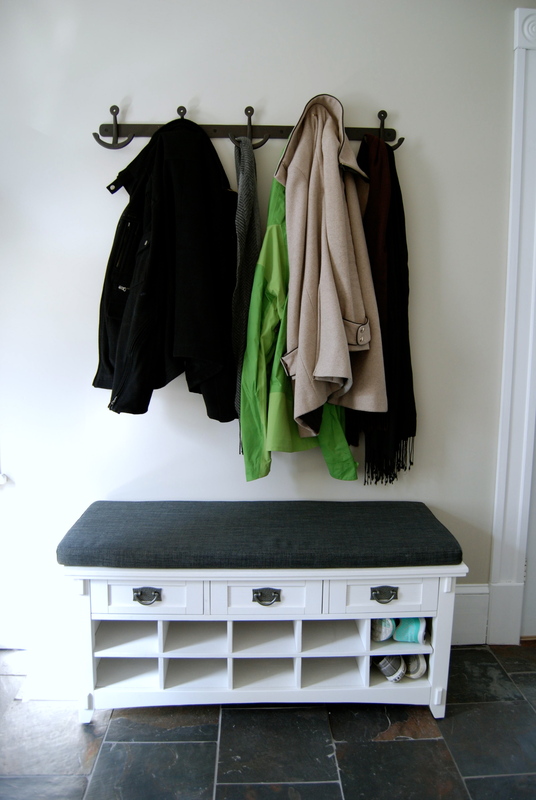 It’s the perfect addition to our mudroom and looks great over our still sort-of-new bench! Our mudroom is currently “the room with the treadmill” but eventually we will add storage solutions to make this an uber functional space. That wall to the left of the window in the photo above is the perfect spot to tuck away some free standing closets. 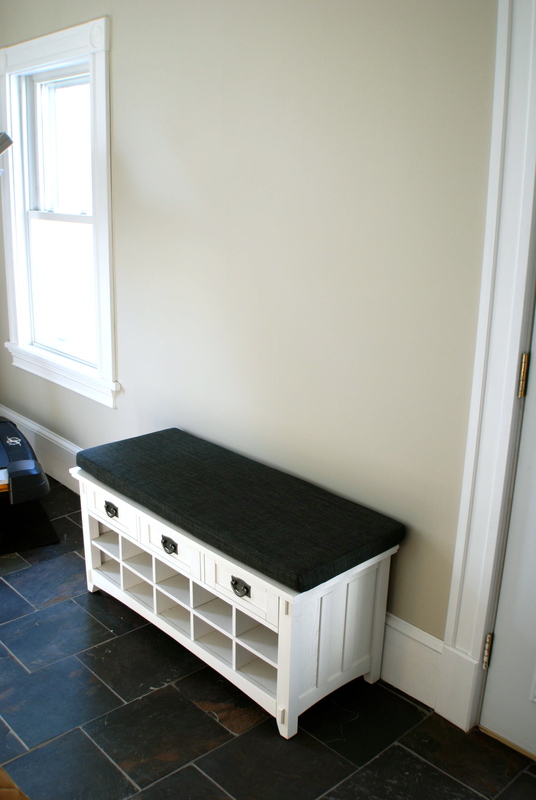 If you remember back in November I talked about the need for closets in the mudroom here. So here’s what we’re thinking. These PAX cabinets from IKEA are just perfect for the space. I love the shaker style fronts and the slate grey color. We could devote a single door closet to my cleaning supplies (vacuum, Swiffer, various bottles and sprays) and a double door closet to off season clothing like the bulky jackets and boots that are currently taking up half of our closet space in our bedroom. Have you visited the IKEA website to design your own PAX Wardrobe? Select your size and doors and then the inside combinations are endless! Your can insert drawers, shoe racks, boxes, bins, you name it! 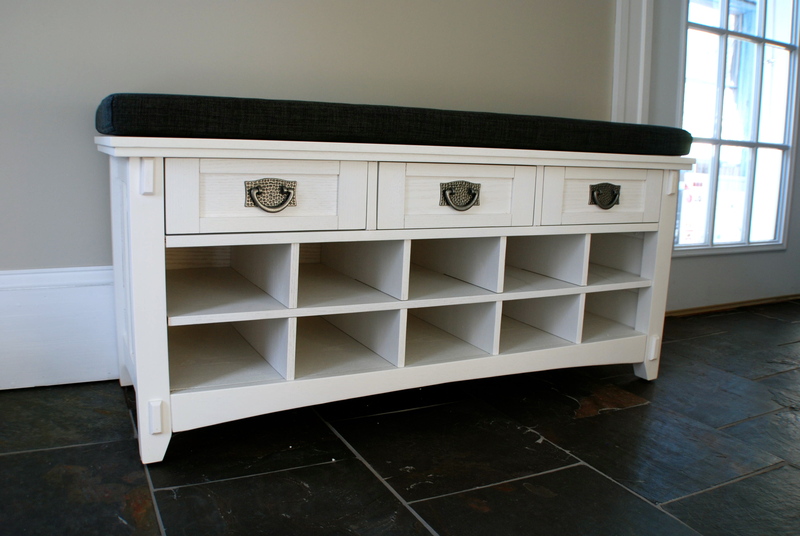 It’s the perfect storage solution for any room without closets. Happy storing! Great expression. And now you can! In our mudroom! 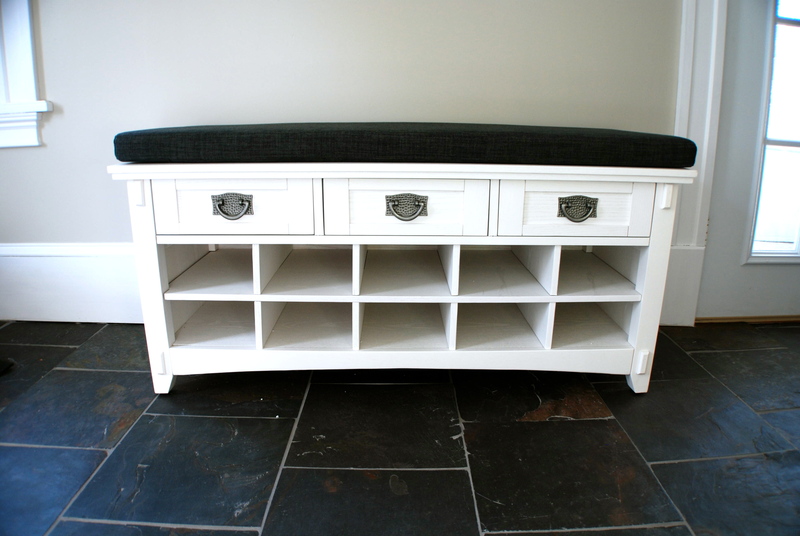 This new bench came fully assembled from Home Decorator’s Club and we love it. It’s the perfect fit for this wall and the perfect blend of colors and textures. We plan on adding a rack for hanging coats above our new bench. There’s plenty of space. Maybe something like this shelf from Pottery Barn. Although I’d like to have more than three hooks and a shelf like this seems more like a dust collector in such a functional space. We’ve talked about doing something funky like a piece of driftwood with hooks to play up the greys in the slate and add something fun to the room. I’ll share our “whenever we get to it” plans for the rest of this room tomorrow. Until then, pop a squat and I’ll catch ya later! Progress on the mudroom is moving right along. We finally have trim! We’ll spend the weekend on final coats of paint, changing out hinges, making sure all electrical outlets have plate covers, and cleaning that sun porch. Ick! But I can’t have our lovely french doors look out onto a recycling bin, grout buckets, and trowels! And speaking of grout… ta da! We used the same pewter grout we’ve used in both bathrooms. The slate looks stunning with the grout in place. I’d say our resident tiler has outdone himself! Great job Jared!